After several days in Yosemite, communing with nature, we looked forward to having basic services again, like water and power. This comes with a trade off though. As we head further south along the Pacific coast we are starting to get into those more populated areas, which means more traffic and noise. We selected the Monterey Vacation RV park. It was very basic, kind of run down with many full-time residents and it sat right beside HWY 101. It was like sleeping in the middle of the Daytona Five Hundred, it never let up. Fortunately we were out and about for most of our stay. 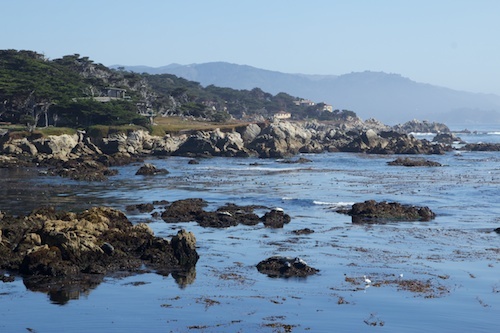 We drove the 17 mile drive, around Monterey Peninsula and through its many golf courses, including Pebble Beach. 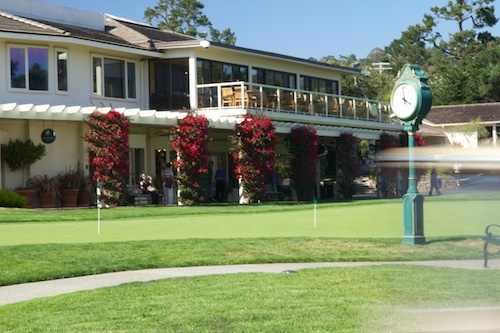 The scenery was spectacular (more rocks and crashing waves) and at Pebble Beach we walked through the club house, saw all those famous silver and crystal trophies you see on TV and watched some players finish up on the oceanside 18th green. 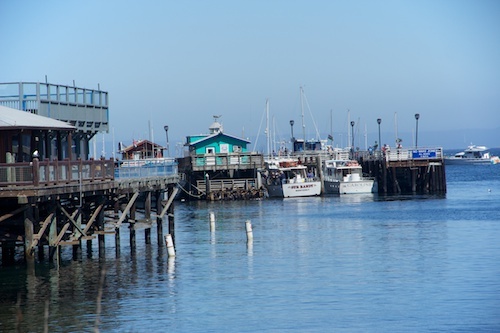 We explore fisherman’s wharf, had a nice lunch at Isabella’s, and watched all the seals sunbathe between begging for food as the fishing boats came in. Since it is September, the summer crowds are gone and it made for an enjoyable afternoon. We also drove down the Pacific Coast Highway to Big Sur. Lots of heavy fog obscured many of the views, but made it more interesting. All-in-all a very touristy stop with lots of driving and sight seeing. The area outside of Monterey, around Salinas, is a valley between two mountain ranges filled with huge farms of artichokes (Castroville, the artichoke capital of the world) all kinds of lettuce, strawberries and who knows what else. They called the area the “world’s salad bowl.” It made me crave a fresh bowl of veggies every time we drove through it. I am continuing to enjoy your journey. All of your photos are inspiring. 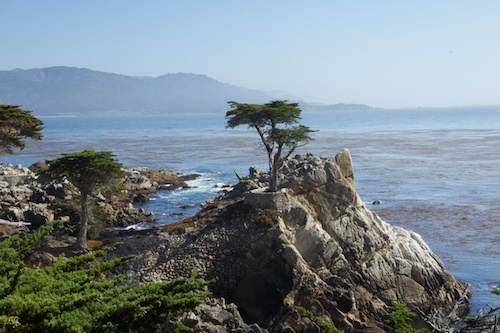 The lone pine is my favorite this time. We took that drive a year ago this June, it is as beautiful as your photos show it to be. Thanks for the memories! We did this trip last summer while waiting to see what developed with the Hantavirus in Yosemite. They had just discovered the virus and we weren’t sure if they would close the park. 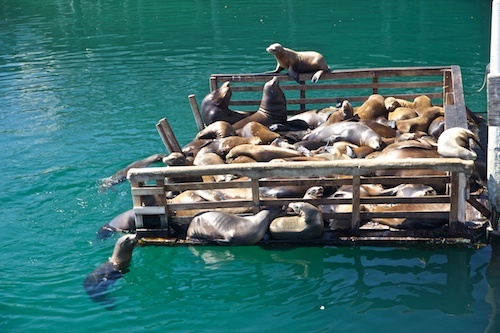 So we “suffered” through a week in Monterey Bay!! Terrific move. What a magnificent place! Love those seals! Such a tough place to have to stay! No virus in Yosemite this year, though they still had informational posters about it. I just noticed in the photo with all the fog there is a large bridge in the distance. That bridge gives the rest of the photo more perspective. Hi there. Yes that is a bridge, and the narrow, winding road hugging the mountainside. Fog actually made it less nerve wracking than usual since you couldn’t see the drop down to the rocks and ocean. Oh love it. 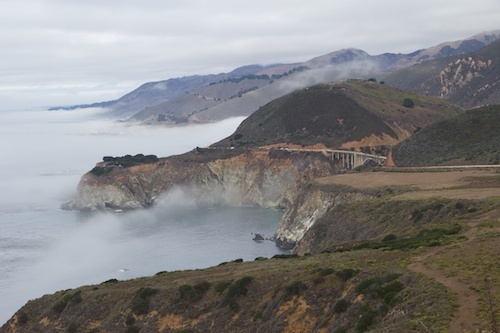 You are making me homesick with all your great photos, especially that Big Sur.